Do you have an existing hifi system that’s too old to support Apple Airplay? 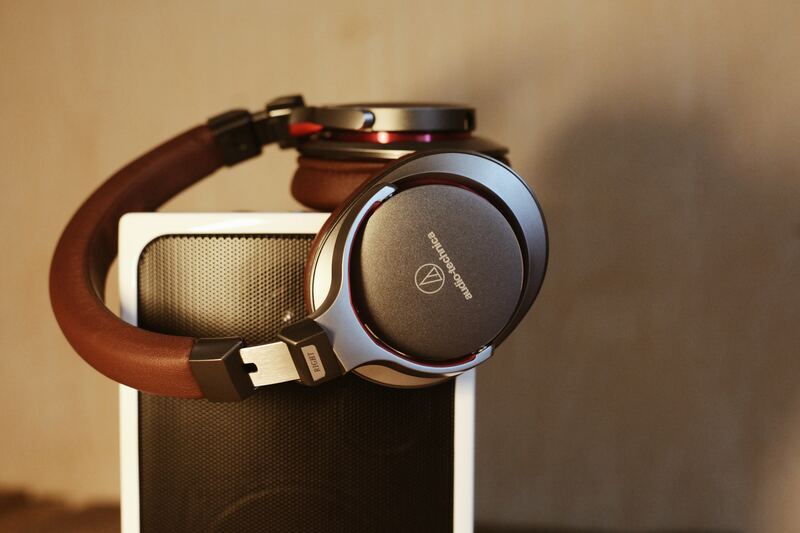 Don’t want to replace it with lower-quality wireless speakers, but want to stream music? It’s a common problem. The good news is, for the cost of a Raspberry Pi you can build an Airplay server so you can stream music directly from an iPhone or iPad to your hifi system. This guide shows you how to set up Shairport-sync so you’ll have a Raspberry Pi playing music in 7 easy steps. Before you can set up a Raspberry Pi as an Airplay server there are a few things you’ll need. You may have one lying around already. Most models should work, but the Pi Zero will be a problem because it’s harder to set up a network on the Zero. I suggest googling to find out how to do that before you start. If you have a Zero W model then things will be easier, and the single-core CPU in there works pretty well for streaming so long as you don’t have anything other heavy-duty stuff running. If you’re buying new, I’d suggest a Model 3. I used a Model 3 A+ with no problems, because I wanted a smaller form factor, wifi and enough grunt. The Model B will work equally well. The first thing you’ll need is an SD card with an appropriate operating system. These days there are a lot of different options, from “traditional” Raspbian to dedicated media operating systems, and even Windows 10 IoT. Now, an Airplay server is not like Kodi which requires a rich graphical interface. It’s absolutely possible to run it with no UI at all, since all of the user interaction will be done on the iOS or macOS device. It might be nice to have some kind of display showing the current artist and track information, but that’s very much a stretch goal. For now, concentrate on getting the server working! So with that established you should be looking towards a more barebones system. There’s no need for lots of applications, and for glitch-free operation you want as few processes running as possible. This is to leave as much CPU and RAM as you can for the media streaming application. One problem is that some of the barebones OSes, such as Arch Linux, are are aimed at people with quite a lot of Linux knowledge. They’re quite cutting edge and you’re more likely to run into issues when installing third party applications and libraries. At the other end of the spectrum there are some distributions which are dedicated to this task, and should work out of the box, but you won’t learn anything from that. For those reasons, if this is your first installation of an Airplay device, I recommend choosing Raspbian Lite. It is mature because it’s derived from the original Raspbian OS, but it has had the GUI removed to save resources. It’s entirely command-line driven, and can easily configured to run in “headless” mode, i.e. accessed entirely remotely over the network with no need for a keyboard or monitor. This makes it ideal for putting into an appliance, and hopefully you’ll learn something in the process. If you already have an installation, or are confident in doing that part yourself, go ahead. Once you’re set up, you should be able to login to the Rapsberry Pi remotely from another computer on your network, and your Pi should have internet access. shairport-sync is a fantastic piece of software maintained by Mike Brady. It turns your Linux machine into an Apple Airplay server. One of the best things about it is that it runs entirely on the command line, and while it has a million configuration options, it’s surprisingly easy to get working out of the box. At the end of this procedure you should have a working installation of shairport-sync. Select “7. Advanced Options”, then “A4. Audio”, then choose Option 1 “Force 3.5mm (‘headphone’) jack”. This will force the audio path to the 3.5mm headphone jack. The volume setting is a bit difficult to use because it’s configured in dB (decibels), which if you’re not an engineer are very unintuitive. In decibels, full volume is generally 0dB, and zero volume is around -100dB. But – and apart from the negated scale, this is the main brain-twister – the decibel scale is not linear. You’ll see the output reports this as around -17dB, but crucially you’ll notice it’s barely audible. The percentage is directly converted to decibels, with the upshot that you can only really hear anything below around 70%. So, TLDR: keep the volume set to 100%. Nothing’s going to happen until you start Airplaying to it, so grab an iPhone or something that supports Airplay, and ensure it’s on the same network as the Raspberry Pi. 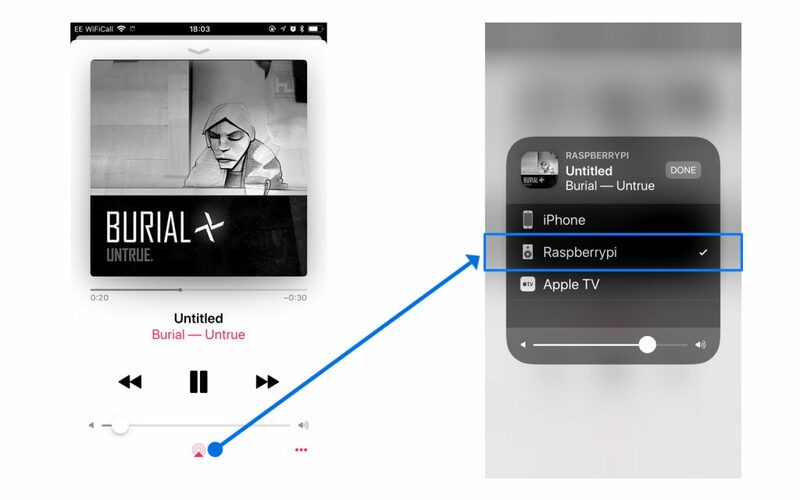 Start playing some music, and from the Airplay icon select “raspberrypi” and then “Done”. If you can’t hear anything, Turn your iPhone (or whatever source you’re using) volume up high, because the PCM (headphone) output on the Raspberry Pi is not great. At this point you should hear the music played through the Raspberry Pi! Created symlink /etc/systemd/system/multi-user.target.wants/shairport-sync.service → /lib/systemd/system/shairport-sync.service. Dec 05 22:30:26 raspberrypi systemd: Started Shairport Sync - AirPlay Audio Receiver. So you should be able to Airplay to the Raspberry Pi now every time you boot it up. Check it’s on the same LAN as your Airplay source device, and preferably on the same Wifi network, and in range. If you’re connected to Airplay and you can’t hear any audio, check the volume levels are high enough. On the source device, just slide the volume up to about 80-90%. If you’re seeing anything below 70% (-27dB) then you probably won’t be able to hear it. It’s best just to keep this setting at 100%. Obviously check your audio hardware too! Thanks for reading this post, I hope it was helpful. Have you had any major challenges setting up Raspberry Pi as an Airplay device? Perhaps you’ve done something really unique, or built some cool hardware. Of you have, or if you just want to leave feedback about the article, please leave a comment below or contact me directly. You can also join my mailing list – see the sidebar. I’d love to hear from you!